Crocheting hats is a great way to master new skills and try out new stitch patterns on a small, manageable scale. The most ornate of patterns often cost a few dollars to download, but you'll also find a number of excellent free patterns available online such as the following two original patterns. 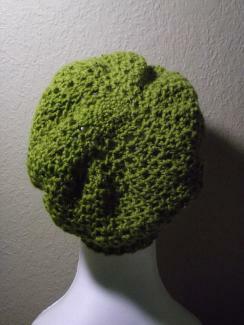 This textured hat's shaping ensures that it drapes but won't droop; it complements almost any face shape. The ribbing is worked flat, then joined for working the body of the hat in the round. Exact gauge is not important for this project. Foundation Row: Chain 13. Sc in 2nd chain from hook. Work one sc in each chain: 12 sc. Turn. Row 1: Work 1 sc in the back loop of each sc. Turn. Repeat Row 1 until the ribbing is between 18 and 20 inches long. Wrap the strip of ribbing around your head periodically to check the size; once the ends come together (with the ribbing stretched, but not excessively distorted), it's time to join and work in the round. Overlap the ends of the ribbing, being careful not to twist. Slip stitch the ends of the ribbing together (creating one extra "rib" at the join). Round 1: Ch1, then work 2 sc in each rib, all the way around. There's a small "space" at the edge of each rib (created when you turned your work after each row) that's convenient to work into, but exact placement isn't critical as long as you're consistent. Join the last sc of the round to the original ch1 with a sl st. Round 2: Ch3. (Skip 1 sc, then dc into the next sc. Ch1, then dc into the same sc.) This is a variation on the "V" stitch. Repeat the pattern in parentheses, all the way around the hat, until you reach the original ch3. (You might have to skip 0 sc once you reach the turning chain; that's no problem.) Dc underneath the base of the original ch3. Ch1, then complete the round with a sl st around the ch3. Round 3 (Working Even): Ch3. (Dc under the ch1 in the "V" stitch from the previous row; ch1, then dc in the same space.) Repeat the pattern in parentheses all the way around. Once you reach the original ch3, dc underneath the base of the ch3, ch1, then complete the round with a sl st around the ch3. Rounds 4 and 5: Repeat Round 3 two more times. Round 6 (Decrease Round): Ch3. (V-stitch under the ch1 of the previous row's V-stitch. Skip 1 V-stitch from the previous row, then V-stitch under the "gap" or "space" after that V-stitch. Skip the next V-stitch from the previous row and V-stitch under the next gap instead, then V-stitch under the second V-stitch from the hook.) Repeat the pattern in parentheses all the way around the hat. When you reach the original ch3 dc under the base of the ch3, ch1, then complete the round with a sl st around the ch3. Rounds 7 - 11: Repeat Round 3 (working even) five times. Rounds 12 - 14: Repeat Round 6 (decrease round) three times. Round 15: Ch3. (Skip 1 V-stitch and the "gap" between V-stitches in the previous row, then V-stitch under the ch1 of the previous row's V-stitch. Skip the next gap and the next V-stitch, then V-stitch under the following gap.) Repeat the pattern in the parentheses all the way around the hat. Complete the round by working a dc under the base of the original ch3, ch1, then sl st around the ch3. Round 17: Ch1; work 1 sc under the ch1 for each V-stitch. At the end of the round, join to the ch1 with a slip stitch. Rounds 18 and onward: Do not chain any stitches to begin this round. Instead, (work 1 sc in each of next 4 scs, skip 1 sc). Repeat the pattern, working in a continuous inward spiral, until you have 15 or fewer stitches. Crown: Cut the yarn, leaving at least a 16-inch tail, and pull it through the last loop from the hook. Using the yarn needle weave the yarn in and out through the remaining stitches, then draw them together to close the top of the hat. If the hole doesn't close completely, weave the yarn in and out through the stitches and gather them together again, repeating as needed until the top of the hat is neatly closed. Finishing: Use the yarn needle to weave in any loose ends, then clip any remaining excess yarn. Once you've completed this versatile hat, you can stitch up a matching crochet scarf to make a lovely set that's perfect for gift-giving. Designed by Alexandra Lockhart, this hat works up quickly with thick yarn and is worked in the round. Measure to check it's 5" across. Rnd 3: Ch 3, dc in each dc. Join with sl st.
Rnds 4-6: Repeat Rnd 3. Rnd 7: Ch 1, sc in each dc around. Join. Rnd 8: Ch 3, working this round in front loops only, *2dc in next dc, dc in next dc. Repeat from * around. Join with sl st. 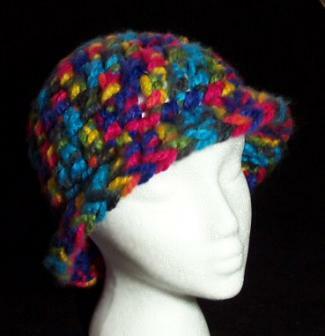 The two-color crochet cap is a quick, simple, project. It's feminine without being frilly, and can be easily adapted to fit almost any size head by simply switching yarn and hook sizes. This outrageous birthday cake hat can also become a table centerpiece. It's created using just chain, single crochet and slip stitches, so it's quite simple for any skill level. This vintage 1942 brimmed lady's hat requires millinery wire to maintain its shape. Another vintage pattern, this beaded cloche pattern comes with the pattern for making a matching tote bag. Michaels offers a free, easy pattern for a matching Tudor scarf and hat set. 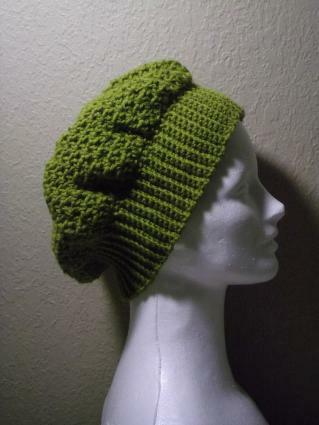 The downloadable honeycomb hat pattern, above, already comes with a matching scarf pattern. If you'd like to create a matching scarf for any of the other hat pattern, all you have to do is identify the primary stitch pattern in the hat. Work a gauge swatch in that pattern to make sure you like its look (and to estimate how many stitches or motifs you'll need for your scarf). Keep in mind that if the hat was designed to be worked in the round, you'll need to reverse the pattern directions on every other round to account for turning your work back and forth as you crochet the matching scarf.